Realtime 3D on the web - a toy or a useful tool? A little late, but here’s the slides from my presentation at the FlashForum Konference in Cologne. 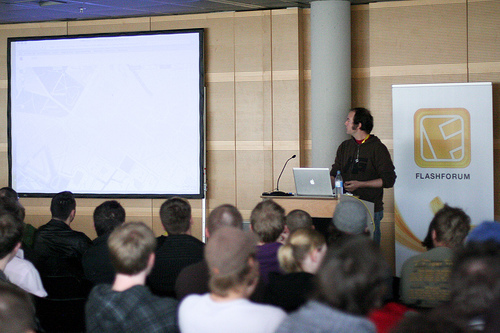 In the session, I discussed 3D on the web and what it’s good for. I started with a historical overview for we’ve had 3D on the web for a long time already. It’s never been a success though and I highlighted some possible reasons as well as why Flash changes this. I also tried to draw up some rules for what constitutes “good use of 3D on the web”. Is showed no code at all in the presentation and the slides don’t give away all I said, but you’ll get the idea. The day before the conference, I also did a full-day Away3D workshop. Renowned community expert Peter Elst was there and I’m glad he enjoyed it! I also did two reports from the event for Flashmagazine. I have to congratulate Marc and Sascha - they really know how to pull off such an event! The mood was excellent. 500 attendees, 28 sessions, 10 workshops and not a glitch. Pretty neat and all served at a fraction of the cost of other conferences? Pretty impressive if you ask me! I had a great time! 3 Responses to Realtime 3D on the web - a toy or a useful tool? Thanks for sharing Jensa! See you on monday?